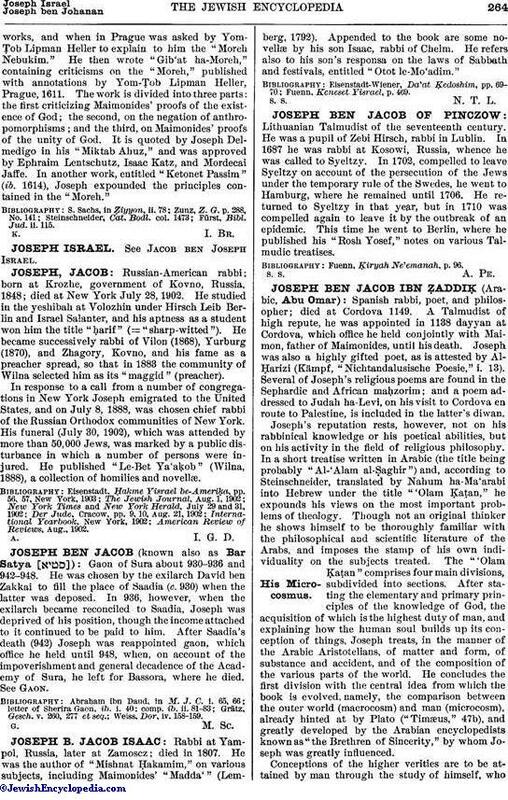 Russian-American rabbi; born at Krozhe, government of Kovno, Russia, 1848; died at New York July 28, 1902. He studied in the yeshibah at Volozhin under Hirsch Leib Berlin and Israel Salanter, and his aptness as a student won him the title "ḥarif" (= "sharp-witted"). He became successively rabbi of Vilon (1868), Yurburg (1870), and Zhagory, Kovno, and his fame as a preacher spread, so that in 1883 the community of Wilna selected him as its "maggid" (preacher). In response to a call from a number of congregations in New York Joseph emigrated to the United States, and on July 8, 1888, was chosen chief rabbi of the Russian Orthodox communities of New York. His funeral (July 30, 1902), which was attended by more than 50,000 Jews, was marked by a public disturbance in which a number of persons were injured. He published "Le-Bet Ya'aḳob" (Wilna, 1888), a collection of homilies and novellæ. American Review of Reviews, Aug., 1902.